Home / Giveaway / Birthday Giveaway Day Ten: Guess What…It’s my BIRTHDAY! Birthday Giveaway Day Ten: Guess What…It’s my BIRTHDAY! Guess what? Today is my actual birthday! 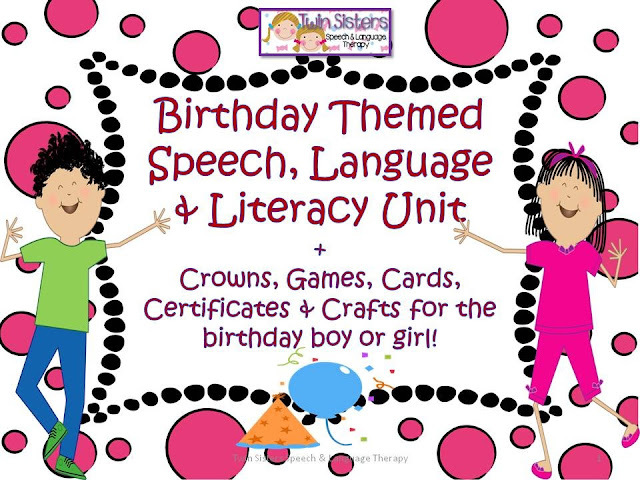 So what better way to celebrate it than to give away a HUGE 112 page log Birthday Themed Packet from Twin Sisters Speech and Language Therapy Blog. This fun themed unit could be used all year long. Birthday present themed reinforcer page. Pin the Tail On The Donkey “WH” Question Game. Birthday Party Memory Match Game & Vocabulary Cards. Birthday Party Game Board, Die & Markers. Birthday 8 to 12 piece puzzles. Birthday boy and girl certificates. Number and count the cupcakes. Birthday party item size sort. Birthday object and color naming cards. Upper and lowercase letter match. Trace and copy the letter and word pages. Alphabetize the birthday party related words. This looks great!! Birthdays are a great non-religious way to celebrate and have fun. With all of these birthday activities, I can pick and choose to make each child’s birthday celebration in speech just as special as the child and just as individual as the IEP!!! You have awesome creativity! I like having a special way to celebrate kids birthdays during speech sessions.